Al Nagler’s posting last week (Winter Star Party 2017: in the Eye of “Kermitis”) described his experience designing the optical system for the visual infinity display simulator used by the Apollo astronauts to land the “LEM” on the moon. Through a long-term loan from the Smithsonian, the Tech Works! technology museum in Binghamton, NY, has obtained parts of LEM simulator and asked Al to consult on its restoration. Above is the Lunar lander that was simulated. 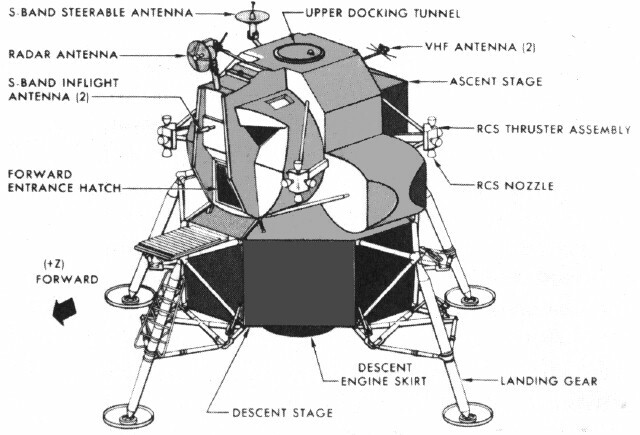 While the news reporter calls it the Lunar “Exertion” Module, it was originally the “Lunar Excursion Module” (LEM) and later shortened to just Lunar Module (LM). NASA diagram. Behind the scenes, Al has gathered together help from some ex-Farrand engineers who worked with him on the project and remain close friends to this day. While the Tech Works! team has a lot of work still ahead of them, some significant progress has been made in getting this 50-year old piece of technology working and ready for future public demonstration! Al’s recent visit for a work session with the Tech Works! staff coincided with the “Roots of Simulation Reception.” NewsChannel 34 in Binghamton was there for the story and has posted a video report “Is Binghamton really the birthplace of Virtual Reality?” from the exhibit. A vital piece of the simulator shown in the video is a “star ball” with a representation of the sky. This “Celestial Sphere” was positioned and rotated to accurately reflect the sky’s motion during a lunar mission. The optical system which imaged the sphere and lunar surface, combined those images, and then brought them into the LEM’s “window” for the astronauts to view was designed by Al Nagler while he was with Farrand Optical — Farrand was a subcontractor to the Link company of Binghamton, NY that put the simulator together. The Celestial Sphere was created by embedding 1,000 ball bearings on a black sphere. Each bearing was sized to match the magnitude of the actual star — Al even gold-plated some of the ball bearing to match the hue of real stars. When completed, the 110° field of view through the simulated LEM window left an impression on Al. Years later, this view inspired him to design wide-field “spacewalk” eyepieces for amateur astronomers. Diagram of the simulator optical path. 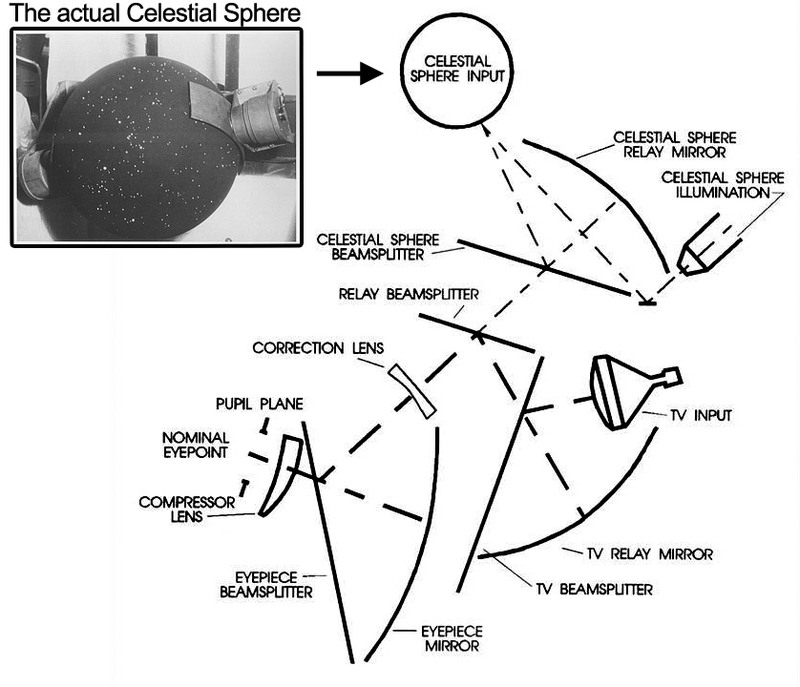 Celestial Sphere and Relay Mirror are featured in the video report. The “TV Input” was a video feed of a large-scale model of the lunar surface. Beamsplitters were used to combine the various images that were viewed through the simulated LEM window at the “Nominal Eyepoint”. The video report begins with airplane simulators built by the Link company and proceeds to the lunar lander simulator in the later half. 3:25: Al Nagler standing in center-background of frame, near — what else — a telescope! Judi Nagler is sitting to the right. Stay tuned to the Tele Vue blog for progress updates on the LEM simulator restoration by Tech Works!. Hopefully one day we will all be able to visit Binghamton, NY and get a look at the actual view that inspired Al in the late 1960s! 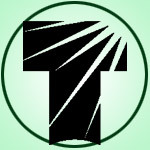 -Find out more about Tech Works! Previous Previous post: #televue40: Show Us Your Tele Vue Images! Next Next post: Tele Vue: What’s in a Name?